My constant pursuit for improvement has spanned my entire life, with even more fervor in the past 25+ years. The success I have achieved and common theme in many of the courses, seminars and books has all been a direct result of this teaching: change the way you think about yourself and see that you can accomplish anything. Overcoming limiting belief and tribal programming are two of the biggest hurdles people face in recreating their lives or building a business. Just look at the number of business and relationship failures, and you will notice that most have not shifted the way they think in order to create new possibilities. When I started on Twitter I did not have a plan of what I was going to achieve or promote. I started to share motivational messages, primarily because I received so much value and help from reading them countless times. Each time I came across a motivational message, there was always a new slant on the quote, because I had changed from the previous time. Over the years I have attracted thousands of people who have read, applied and retweeted those motivational messages hundreds of times per day. I have learned that the world is still in need of motivational messages. Zig Ziglar, once said, “People often say that motivation doesn’t last. Well, neither does bathing – that’s why we recommend it daily”. That is why my focus has been on sharing messages that will enlighten and inspire people to become the best they can be. In my business and life coaching journey, I have learned about and practiced affirmations, mantras, meditations and the Law of Attraction, and firmly believe that we create what we think about. Our words and thoughts are manifested in our physical world. Many do not realize that they alone control what they think and what those thoughts bring into their existence. What you are experiencing is the result of your most powerful thoughts. If you don’t like the results, you need to shift your thoughts to what you truly desire. In my continuing effort to help the Twitterverse and all the lives I touch, I have written hundreds of affirming thoughts and share them using the hashtag #JustForToday. They are simple messages to help shift your thoughts in a positive direction. Find the thoughts that resonate with you, or create your own and share it with us. Repeat those thoughts throughout the day. The more positive messages you fill your head and heart with, the easier it will become to accomplish your tasks and goals. There is no denying that becoming more positive in our thoughts, words and actions will dramatically change our corner of the world. The more we can create this shift and introduce this simple process to others, the more we can create a better world. Join me in sharing the #JustForToday messages with your connections. Find the #JustForToday thought that you really need, and repeat it at least twelve times a day until you notice that you have overcome the challenge. Create your own #JustForToday message and share it with the Twitterverse, and in doing so you will connect with others who may be or have experienced the same challenge. 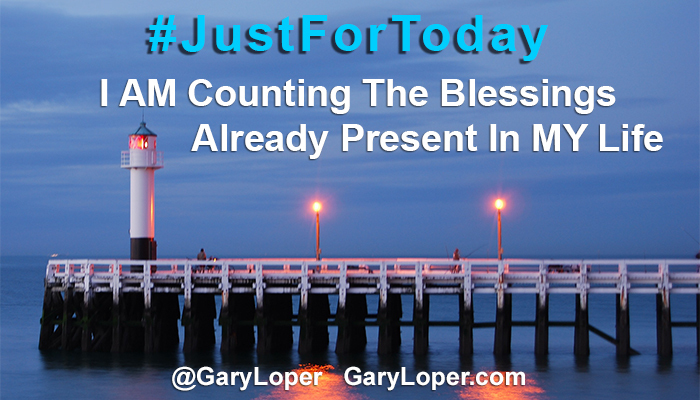 Please follow me on Twitter, and let me know about your experiences in living and sharing the #JustForToday messages.